Don’t you just love winter? I know that I do. Winter is my second favorite season, second only to fall. Living in NW Pennsylvania near Lake Erie, we get a LOT of snow every year. We live in the snow-belt region of the country and I love it! Yesterday I was delighted to showcase the art and talent of Meg Newberg. Meg does a lot of awesome things with clay, but her best are made with millefiori canes. Today she’s going to show us her snowflake cane and where you can purchase the tutorial to make it yourself as well. Polymer Clay Tutorial of a Snowflake Millefiori Cane by Meg NewBerg ow.ly/fa7f3 Visit the blog to see this awesome cane today! One of the things that drew me in to Meg’s Etsy Shop was the affordability of her polymer clay cane tutorials. Her tutorials range in price from just $4.00 to $10 for eBook tutorials. Confession is good for the soul, right? Well….I was going to make my own snowflake cane and post its pictures with this post…alas, I got too busy working on another project that I couln’t get to making my own cane. So….I will have to try my cane another day. Until then…let’s admire Meg’s canes, shall we. 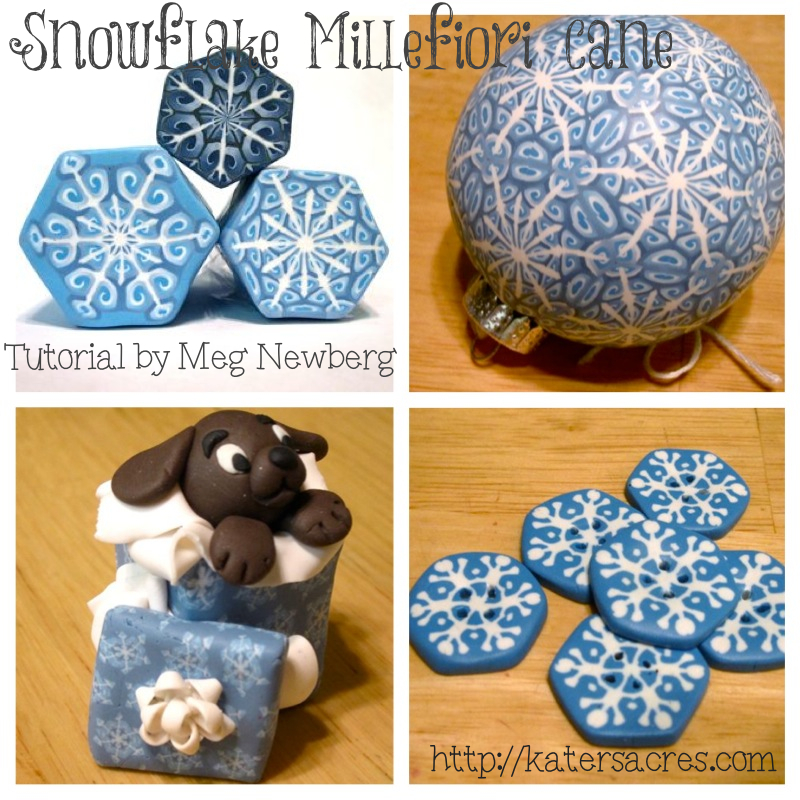 I purchased the combination snowflake polymer clay tutorial from Meg. This tutorial included both her easy snowflake cane (shown above) and her intricate snowflake cane (shown at left). The photographs of her step by step process are very easy to follow. Please know that in either case (both the easy & especially intricate patterns) you need a basic knowledge of polymer clay and millefiori cane making.